One of the curious things about living in a friary while still trying to learn the local language is that you don't really get to know the other brothers. Unless you somehow know of them on paper or by office or reputation, the language barrier prevents or at least renders difficult some of the ordinary mechanisms of acquaintance. It's not a bad thing, but just is. It is, however, an interesting thing. My not knowing what I might have known by now about some of the brothers around me reminds me of the irreducible mystery that other people always are, and leaves me more attentive and grateful for what I do perceive. For example, one of the friars I live with is an Indonesian, about the same age as me in religion. His project in life right now seems to be the study of Arabic. Beyond that, I hardly know a thing about him, apart from the diligence, kindness, and devotion I observe. It touches my heart in a way; very early in my Christian journey I had the song on a Taizé tape to which I listened often. As I start to think of my twentieth anniversary of baptism coming up next month and all the twists and turns, amazing graces and blind alleys, the few graces to which I have surrendered and the many sins by which I have clung to my misery, I'm grateful for such an apparently little thing that arrives to remind me of the unity of the economies of grace and the gentle persistence of the love of God. A couple of months before I made the big move over here to Italy, one of my wisdom figures among the friars paid me a visit and gave me a talking-to. One of his advices to me was to avoid the difficulties of transition altogether by just treating the transfer as if it were a vacation, for the first year or so, he said. As constitutionally incapable as I am of taking up such advice, I thought of it today on the first altogether free day I've had since coming to Rome. For the occasion, I decided I would treat myself to something distinctively Roman. So I joined the crowds on the march from the Metro to St. Peter's Square and visited the lovely little bookstore of the Libreria Editrice Vaticana. There you can see all kinds of lovely things, and would that you might need them, like 'eucharistic prayers for concelebration' booklets in Latin, for instance. There I found something that I've been thinking about picking up for a while, a copy of the 2004 Martyrologium Romanum. Today for Mass we celebrated blessed Maria Teresa Kowalska, a Capuchin Poor Clare among the 108 martyrs of the Nazi persecution beatified by John Paul II. And here she is, with a couple days difference, as the latest entry for July 25. Most of the time it's too hard to say that you're from Connecticut. It's a hard word on the Italian ear, and you just end up saying that you're from north of New York anyway. I've found that with academic types I might be able to say that I'm from New Haven, but mostly I don't bother. A not insignificant number of times when I've told a priest or religious that I'm from Connecticut they hear instead 'Kentucky' and start talking about Thomas Merton. Since Kentucky also has a New Haven, I suppose I could contrive an even more confusing conversation if I were in the mood. To cause even more trouble, I could try to explain how my first experience of religious life was the summer I spent as a volunteer at the Benedictine sisters of Floyd County, Kentucky, which is nowhere near the Abbey of Gethsemani. One of the things I enjoy about this language-learning business is the chance to learn--as we were told people did in the olden days--with the language of the Sacred Scriptures. This is to say that in addition to the classes, there is also the daily liturgical environment forming one's learning. In the text we were working from in class the other day the group stumbled on the word la folla. It turned out that I was the only student who knew the word, because I had heard it several times in the gospel readings at Mass: Gesù disse alle folle..., "Jesus said to the crowds..."
It reminded me of something from when we were at Spanish language school in Costa Rica. When we had arrived at the lessons on using properly the different past tenses, one of the exercises was to tell stories from our past. Without thinking about it, we would begin, "en aquellos días...," which is the usual Spanish way of rendering the Biblical opener that we know in English as in those days..., as in in those days a decree went out from Caesar Augustus..., famously on Christmas eve. Well, the teachers would find this very amusing, to hear us speaking in what they heard as a biblical style. But we didn't mean to be pompous or even religious; it was just that we had heard these phrases, had begun to understand what they indicated in the simplest of senses, and had used them because they had remained in our minds. And for such, as a form of prayer that the Holy Spirit works in his students, I'm grateful today. Even in this age of smartphones and tablets, I still carry a little old-school notebook with me. In it are the most random of all notes: scribbles from meetings with formation, spiritual, and academic directors, rhetorical notes-to-self, directions to places, digests of bus schedules particular to the certain times of day when I would habitually need them. One of the best recent additions I have made is the absolution formula in Italian. I don't know why, but it's happened several times that someone here has just come up to me and asked to confess. Maybe it's what they do in Italy. Maybe it's because they can see that I'm a foreigner, probably don't speak the language very well, and will therefore have to be quick about it. Maybe it's what the Holy Spirit arranges for my encouragement and for whatever graces he wills for these seemingly random penitents. As this happens, it forces a duty on me. 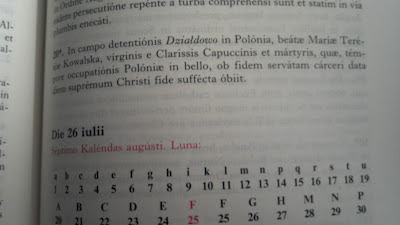 I myself have to start going to confession in Italian. It's not because I have to; here in Rome as it was in Assisi it's easy enough to find an English-confessing priest at one of the basilicas. But I realize that if I'm going to hear confessions in Italian I have to go to confession in Italian. I need to know the critical vocabulary of the encounter; the way the words work and flow according to the customs and scripts of that very particular moment, the terms and syntax that are recognized in the naming of grace. It's like when we were in the novitiate in Honduras and were challenged to share vocation stories with the novices; the most critical term was inquietud; it was a way of talking about a motivating restlessness in the heart. I never would have happened on the word myself, but in that setting it was an indispensable term for speaking of an experience of God. 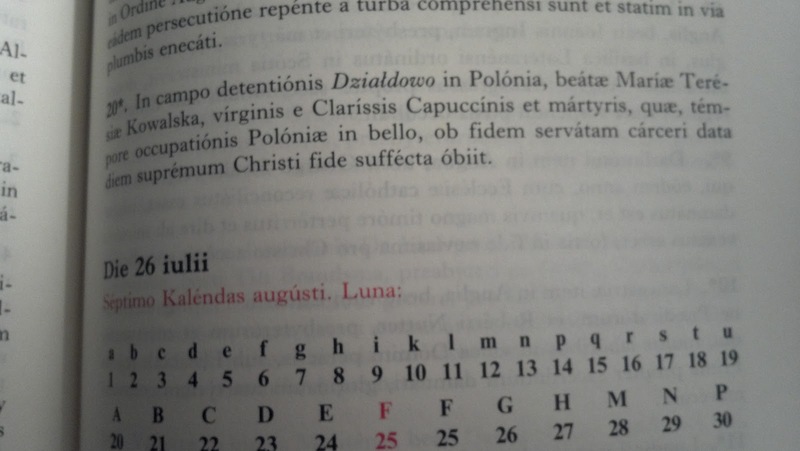 So, one of the current projects is to prepare for my first confession in Italian. I have arrived in Rome and will be staying in a small friary for a spell. Tomorrow I am to become a student at the "Torre di Babele," which seems like a very inauspicious name for a language school. They have placed me in the 'level 3' class. Depending on whom you ask, there are either seven or eleven levels. Such mysteries, the suggestion of secret levels, and name of the place make me wary of masonic influence. Perhaps the Holy Spirit will soon provide me with a worthy confessor willing to discuss such things. "Happy dreams." As Holden Caulfield would say, that knocks me out. Also, I shall have to use the "time for prayer" in the morning for meditation, since I wouldn't pray a private Mass when I had the opportunity to pray with the sisters, and I can't say Matins because my set of 1962 Roman-Seraphic breviaries was one of the hard sacrifices I made when I was packing up for my move to Italy. When I joined the Capuchins twelve years ago I went through a couple of immediate culture shocks related to things I missed. The first was cocktail time. In the twenty-eight and a half years I had been on this earth from the day of my birth until the day of my entrance into the Capuchin postulancy, I had never experienced a lifestyle arrangement that didn't presume a time for drinks before the evening meal. Much to my shock we processed most suddenly straight from Vespers to the dinner table. I was quite surprised and not a little thrown off. Now I'm all for the austerity which we Capuchins claim as our particular Franciscan heritage, but there's a fine line between that and abandoning the characteristic hallmarks of civilized men. I've never complained publicly about this issue, but perhaps the day will come when the right moment and forum will materialize. Adoramus te, Domine Jesu Christe et ad omnes ecclesias tuas, quae sunt in toto mundo, et benedicimus tibi, quia per sanctam crucem tuam redimisti mundum. We adore you, most holy Lord Jesus Christ, here and in all your churches throughout the world, and we bless you, because by your holy Cross you have redeemed the world. It's always been one of my favorite bits of St. Francis, and a daily reminder of his Testament, which has been dear to me over the years. There's the deep, mysterious and very biblical sense of blessing God, the centrality of the Cross in the Franciscan vision, all at once necessarily embedded in the ecclesial. We bless God and adore the Cross. Where and when? Right here, right now, in this particular place as well as in all the churches through the world in all of their own particularity. Ti adoriamo, Signore Gesù Cristo, qui e in tutte le tue chiese che sono nel mondo intero e ti benediciamo, perché con la tua santa croce hai redento il mondo. A couple of days ago there appeared here in the friary a Brazilian diocesan priest to make of himself, like me, a beginning Italian student. Tonight he arrived at supper with a vocabulary list containing the various names of things related to food and meals. The brothers seemed to find this very entertaining, and enjoyed pointing out and displaying instances of the various terms: plates and bowls and glasses, forks, knives, and spoons, bread and wine and cheeses, fruits, vegetables, pasta and meat. But one little trouble was encountered when an item was found on the list that was not in evidence in the refectory: la birra. Well, apparently unwilling to be shown up by someone's Italian homework, Father Guardian summoned his minion to the head of the table, who then scurried off and returned moments later with a chilled bottle of Beck's for anyone who wanted one. This was all very surprising to me, as I have lived in this friary for almost six weeks and have never even seen a bottle of beer, much less been offered one. So I guess it pays to do your homework. Who knew? I should be so fortunate as to gloriously conclude my Franciscan career by being burned at the stake in Marseilles, with soldiers guarding the pyre for days and the ashes stolen away so that none of you, my kind readers, might have relics, but it's probably more realistic for me to look forward to a death somewhat more in harmony with my shallow spiritual condition. Hai fatto di San Benedetto un novello Abramo, padre di moltitudini di santi. "You have made of St. Benedict another Abraham, father of a multitude of saints." I checked the typical edition, and this prayer doesn't appear there, so we may rest easy knowing that the Joachimite heresy has not been reborn at the center of holy mother the Church. But it seems to be alive and well somewhere. I'm looking at you, Italian bishops' conference! If there is anyone out there who prays the Hours from another European edition, I would be very curious to know if you also prayed this prayer today. I went out of the friary around eight and took the short walk down to the basilica of St. Francis. The early Mass was just finishing up as I made my way to the stairs that go down to the tomb. It was early enough to still be pretty quiet and empty down there. A conventual friar was saying his breviary. A sister whom I remembered seeing on the bus yesterday was praying quietly. I sat down and opened my breviary. Clerici faciant divinum officium secundum ordinem sanctae Romanae Ecclesiae. Invitatory. Signore, apri le mie labbra/e la mia bocca proclami la tua lode. Office of Readings, then Morning Prayer. O Dio, vieni a salvarmi/Signore, vieni presto in mio aiuto. At the end of the intercessions, I try to pray for everyone who arrives in my thoughts: the friar and the sister and all of the pilgrims who will visit the tomb today, the American Capuchins here in Assisi on the perpetual profession pilgrimage, the new priests and deacons at home, the friars at home preparing for temporary profession and the postulants looking forward to investiture, the other students at the Italian school, and all those who have suffered on account of my sins and negligence. Officium dicebamus secundum alios clericos...et eramus idiotae et subditi omnibus. Most High and Glorious God, I give you my heart to make me so by whatever means you will. Holy Father Francis, pray for me. God Most High, the Creator of the heavens and the earth, of all things visible and invisible, through the sublime humility of the Incarnation of the Eternal Word, gives himself to me under the little form of bread. And yet I know that the Body of Christ I receive is the broken and sacrificed Christ crucified. Receiving him into my own created body and my own created soul, I confess to God the desire for that same humility, a desire that he himself has worked in me in his mercy. And I pray for the willingness to become simple and subject to all. I wouldn't presume to say that I have much in common with our holy father the Pope, Benedict XVI gloriously reigning. Nevertheless, we are both Catholic priests, foreigners living here in Italy, fans of St. Bonaventure, and native speakers of Germanic languages. And as I begin to live here in Italy, I am noticing ways in which I have come to understand Benedict a little better. First, Fanta. There was some amusement when it was reported some years back in the secular press that Benedict likes Fanta. Fine. It is a little funny to imagine the dignified old professor-pope enjoying a sweet, bright orange soda. But here's the thing, at least for you Americans: here in Italy it's quite a different substance, this Fanta, and much superior to what we have at home. So I get it. Yum. Second, the so-called 'Benedictine Altar Arrangement.' To some, the Pope's apparent preference for six candles and a crucifix arranged on the altar itself is a welcome symbol of his 'hermeneutic of continuity.' To others, it is further sign that Benedict is a crypto-traddy making every effort to roll back the reforms that followed the Second Vatican Council. Living here in Italy, as the Pope has for many years, has helped me to better understand his preference. You see, there seems to be a very common style for arranging altars here, and it goes like this: you take all the candles, whether these be one, two, or even four (that's the most I've seen, and at the lower basilica of St. Francis no less) and put them all the way on one side of the altar. On the other side, you put a flower or plant or even a whole floral arrangement. In this practice I perceive the drive towards modernist unbalance that smolders away in the Churches, and the rotten and relativist fruit of which we all know so well. So as I see more and more of these unbalanced altars, I understand more and more why a thoughtful priest like Benedict XVI might want to restore some classical proportion to the setting of the Sacrifice.